This preparation contains a combination of vitamin C and zinc, which contribute to prevent the occurrence of viral and bacterial infections. Both these substances are important antioxidants and support the immune system. This preparation is recommended to everyone, particularly in winter and early spring, when it is necessary to reinforce the resistance of the organism against colds and infections. Vitamin C plays a significant role in a number of life processes. It is necessary for maintaining a good health. It provides protection in the case of influenza epidemics, it prevents occurrence of viral and bacterial infections and also stress and it improves functioning of the immune system. Every stress of the organism leads to an increased loss of vitamin C, which must be compensated in a suitable way. 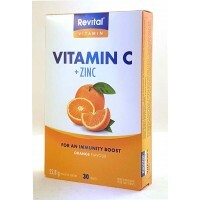 The lack of vitamin C causes higher fatigue, irritability, insomnia, weak resistance against colds and infections. Zinc also has a great importance for the functioning of the immune system. It controls and regulates metabolic processes and enzyme system activity. It is important for a perfect functioning of brain, heart and blood circulation. It contributes to wounds healing and reduces cholesterol storage, which prevents arteriosclerosis. It is helpful for male potency disturbances and is indispensable for normal functioning of prostate. In general, zinc positively affects the quality of the skin, hair and nails, counteracts acne and contributes to a prevention of osteoporosis. Food supplement - without added sugar. With sweetener. Suitable also for diabetics.